Congrats to our Top Realtors for July 2018! Our great summer selling season continues with $11.5 Million in sales for July at Davidson Realty. A special shout out to our Top Producers. Ron Savarese was our top producer with 4 closings this month. While skillfully handling his closings, he also sold $1.5 Million during the month. It is always hard to reach higher than Mirtha Barzaga. Mirtha is our top lister and sales agent with over $2.7 Million in sales. 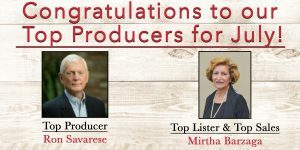 Our top producing team for July is Lynn and Allen Whitley. I enjoy seeing our husband/wife teams be so successful. 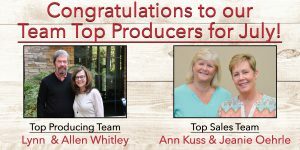 Our top sales team is Jeanie Oehrle and Ann Kuss. They continue to win monthly awards and take great care of their customers. 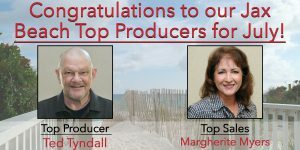 Our Jacksonville Beach office is having a great year with Ted Tyndall our top producer and Margherite Myers our top sales agent. Andrea Gallagher and I are proud to have a team that supports each other every day! Congrats to our Top Realtors for June & Second Quarter of 2018! June was sizzling and our best month this year with over $13 million in closings. I want to recognize our top performing agents for the month and quarter. All three top awards for closings, listings and sales, go to Suzy Evans for the month. Suzy had $1.2 million in closings and $1 million in sales. Congratulations! 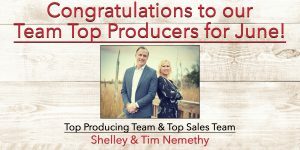 Our top producing team for closings and sales is The Nemethy Group. Shelley and Tim had a great month. They also are the top producers and sales for the 2nd quarter. 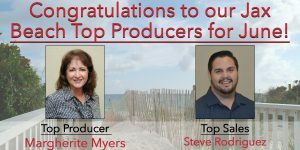 Our Jacksonville Beach office is coming on strong with Margherite Myers as our top producer and Steve Rodriguez as top sales. The 2nd quarter was very good with $36 million in closings. Mirtha Barzaga continued her amazing year by achieving all three top awards for the quarter, top producer, listings and sales with $3.2 million in closings and $3.4 million in sales. 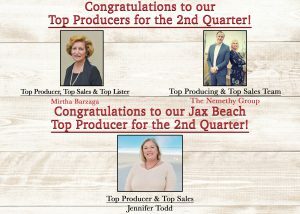 Jennifer Todd was our Jacksonville Beach office top producer with $3.1 million in closings and top sales for the quarter. Thanks to our entire team for an awesome month and quarter! 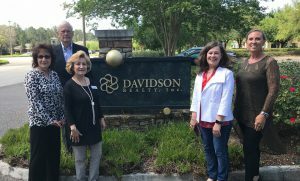 Mirtha Barzaga ended 2017 with more than $11 million in production, Davidson’s highest. She is a Nocatee Certified Agent, Certified Distressed Property Expert and Certified Negotiation Expert. Mirtha is also a recent recipient of two Laurel Awards. 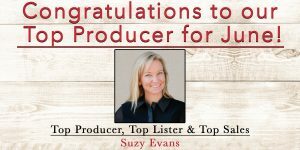 Suzy Evans finished the year with $7 million in production. She is a Nocatee Certified Agent, Certified Distressed Property Expert, Certified Negotiation Expert and Certified Residential Specialist. Marguerite Myers completed 2017 with $5.5 million in production. Ron Savarese finished 2017 with $3.5 million in production. He is a Certified Military Housing Specialist. Michelle Gonzalez had $3 million in 2017 production. She is Nocatee Certified Agent and Certified Distressed Property Expert. Lynn Whitley brought in more than $2.5 million in production in 2017. Lynn boasts numerous designations including Nocatee Certified Agent, Certified Distressed Property Expert, Certified Negotiation Expert, Military Relocation Professional and Accredited Staging Professional. Congratulations to our Top Realtors in July – 37 Closings Made for a Great Month! A big congratulations to our entire Davidson Team for another hot summer month of sales and closings. Our Realtors brought in $12 million in sales and over $12 million in closings during the month. Not only did our awesome team bring in great numbers, July was a great month for everyone that’s part of the Davidson Companies because we launched our brand-new website by RedFin Group! We hope you enjoy our new platform and our seamless new search tools! All of the improvements were done to better serve our customers!